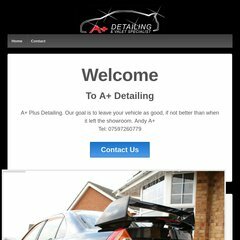 www.A-plus-detailing.co.uk - A+ Detailing | Detailing and Valet Specialist. Topics: Portfolio, Detailing, Valeting, Other Services, and Mercedes-amg E-class. 12 users visit the site each day, each viewing 1 page. ns68.1and1.co.uk, and ns67.1and1.co.uk are its DNS Nameservers. 1 1 Internet Ag Baden-wurttemberg is the location of the Apache server. The programming language environment is PHP/5.2.17. PING www. (82.165.84.210) 56(84) bytes of data.